11600 Adie Road St. Louis, MO 63043 314.692.8388 f 314.692.5152 www.edgetechnologies.com call or click: 314.692.8388 www.edgetechnologies.com BOOTH #338348 FMB Turbo 2-20 Edge Rebel 80 Servo FMB Minimag 20 Edge V-65 Servo FMB Turbo 3-38 Edge Patriot 338 FMB Turbo 5-65 Edge Minuteman 320 SE Bar Feeding. It's What We Do. Edge Technologies Offers Economical Excellence, Superior Design, and The Heaviest Built Bar Feeders, All Backed by a Team Second To None. What's Not To Love? 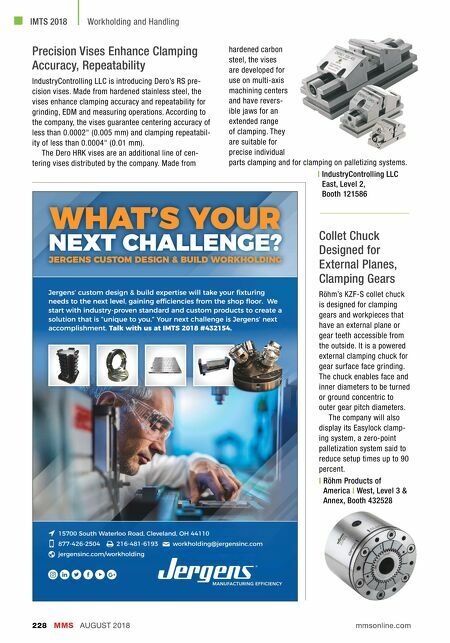 E dge Technologies is a leading productivity solutions provider to the precision metal working industry. We offer the full lines of FMB and Edge bar feeders for Swiss Turning and Fixed Headstock lathes. Edge Technologies is made up of a group of dedicated professionals, a team with over 25 years of experience, who stand ready to pounce on any problem and resolve it immediately. The Edge line of "Economical Excellence" magazine bar feeders and short loaders are the new industry standard for quality at affordable prices. The new Scout 320 is the newest and most economically priced Edge brand magazine bar feeder in the line. If you are considering an economical 12' magazine barfeeder, you should discuss this product with your Edge Technologies Regional Sales Manager or your local dealer before you buy any brand. FMB magazine bar feeders are smartly designed, robust in construction, built in Germany to the highest quality specifications, and all of them are a bit on the hefty side. As a matter of fact, some of them outweigh the competition as much as two to one. That's "Heavy Metal." 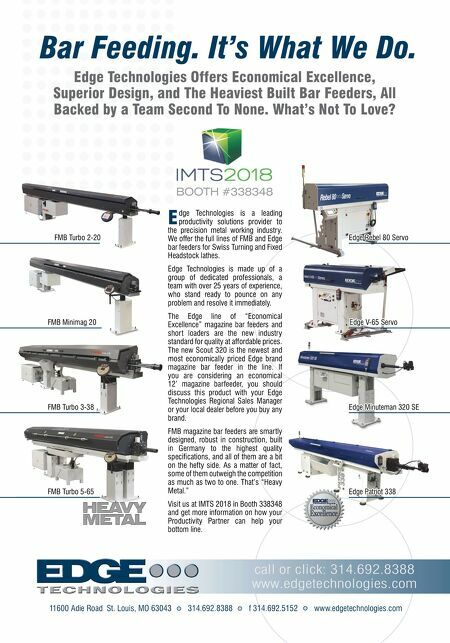 Visit us at IMTS 2018 in Booth 338348 and get more information on how your Productivity Partner can help your bottom line.